Itchy fake beards. Children with heretofore-unknown mucous-transmitted pathogens. Ungrateful parents. However, there are dozens of others vying for the mall Santa position. Many of them even look more Santa-like than you. How do we show the mall’s board of directors that you are the best Santa Claus for your town? Well, don’t get your tinsel in a tangle. With the right mall Santa resume and cover letter, you will be sure to stand out from the others and ascend to your rightful seasonal throne in the center of the mall near the JCPenney’s and the China Panda, just past the fountain. A merry mall Santa resume example that will perform better than 9/10 others. How to write a mall Santa resume that grabs the reindeer by the antlers. The best format for mall Santa resumes that will get noticed. Tips on how to write skills and keywords for a resume for mall Santas. Image: Mall Santa Resume Example - See 20+ resume templates and create your resume here. What’s the Best Format for a Mall Santa Resume? Most of the time, mall Santa hiring managers won’t read your whole resume. And it gets worse: they’ll take only 6 seconds to scan a resume. Just 6 seconds to decide if you’ll be considered for the enviable mall Santa position. What does this mean for you? You need a mall Santa resume format that will grab them by those jingle bells and not let go. A poorly-formatted resume is about as appealing as dropping down someone’s chimney to deliver presents only to find curdled milk and moldy cookies await you. Luckily, it’s not as hopeless as it sounds. Depending on your past work history, there are two main ways to go about this. Been a mall Santa Claus before? Fantastic! You’ve got an advantage. The reverse-chronological format is best for your experienced mall Santa resume. This festive format emphasizes your shopping mall Santa work history and experience. You get to regale them with your stories of Christmases Past. Using this format on your mall Santa resume, you will list your most recent work positions first, and go backwards through past jobs in reverse-chronological order from there. As the standard format, it’s the easiest to read and scan - for hiring managers and applicant tracking systems (ATS) alike. The ATS is a scanner that looks for keywords on a resume. You know how Santa checks his list (twice) for who’s naughty or nice? Yeah, kinda like that. Bigger companies use these to save time. But, how can you write a resume for a mall Santa job with no experience? You might not know this, but you’ve got a sled’s worth of relevant transferable skills! Instead, you’ll list your other work experience, highlighting skills relevant to the mall Santa job by featuring them in bullet points, neatly aligned like the charcoal buttons on Frosty the Snowman. To be a mall Santa you might need to be a great actor. Plus, although you’ll be in heavy costume, you still need to be personable and have people skills (or, soft skills). Prioritize jobs with responsibilities that will be the most valuable on a mall Santa resume. For example, did you previously play the role of the Mad King on Game of Thrones? Your portrayal of glee at the horrific deaths of your citizenry is just the Santa look they’re going for! Don’t have any past work experience? No problem. Instead, begin with your education, followed by non-traditional work (volunteer work, toy-making workshops, etc.) in the work history area. Next, save your mall Santa resume as a PDF. The PDF format keeps the layout in shape (unlike the perfect Santa belly). Pro Tip: Check the mall Santa job posting to make sure PDFs are OK. Some Applicant Tracking Systems can choke on a PDF-formatted resume like a stale gingerbread house. Mall Santa - Resume Summary or Resume Objective? The hiring manager at the mall has to sift through dozens - if not hundreds - of mall Santa resumes and cover letters. You need to make yours stand out, like Rudolph’s nose in a heavy snowstorm. How do we do that, you ask? By including a compelling resume objective or a professional resume summary. But which one? Don’t worry! We’ll go over the two now, and you’ll be able to pick the one which will cause the most holiday cheer. You can stroke your beard with one hand while wrapping presents with the other in your sleep. Do you have mall Santa experience? It highlights your Santa-related work history. It promotes you with a previous achievement. Personable Santa Claus with 2+ years experience in a suburban shopping mall environment. Achieved district-highest children lap-sitting satisfaction rating according to surveys by local radio station (99.96%). Seeking to advance my career by growing with the elves and Mrs. Claus at Fashion Square Outlet Mall. I have been a mall Santa Claus for the last 2 years. In addition to my knowledge of sitting and posing for photographs, I also offered visual recommendations on the layout of my Santa’s Workshop. Take the “Wrong” one: it’s great that you were able to handle the tasks of sitting and staring at a camera. However - and no disrespect - but who cares? You’re just listing your regular tasks as if they were accomplishments, which they aren’t. In the first example, we give evidence of our Santa achievements and experience. The closest you’ve come to a being a mall Santa is when you were 7 years old and your mother forced you to take a picture to send to Grandma. Don’t have any mall Santa experience? It highlights your transferable skills. It promotes you with a Santa-related achievement. Friendly and bulbous senior citizen with 55+ years sitting experience. Obtained highest scores in two different bar trivia nights (100%). Seeking to jumpstart my career by growing with the team of elves at Santa’s Workshop in Fashion Square Outlet Mall. I am a senior citizen eager to use my heavy weight and long beard to get a job that would utilize these features. I don’t have experience as a mall Santa but many people say that I am a fast learner and highly motivated. See the differences here? Fashion Square Outlet Mall is taking a bigger chance by hiring a mall Santa without experience. You’ll need to show them that you are the reason for the season. In the first one, we used some transferable skills from a lifetime of sitting and trivia games (you have to answer children’s questions, after all). The second one doesn’t show enough to hold the hiring manager’s eye. But this one glows, this one glows, this one glows! We want the hiring manager to sing this tune when they see your mall Santa resume. To do that, we need to talk about your past experience in a way that’ll make them light up like a Christmas tree. Here’s how. Champion-level sitter with personable and friendly demeanor. Encouraged and influenced even the shyest children to have a seat on my lap. Instituted drive for an ergonomic Santa throne and other human rights. Sat down and placed kids on lap. Answered existential questions from children. Delegated menial tasks to Mrs. Santa and elves. See the differences? The “wrong” example seems fine, at first - we explained our duties and tasks. However, that’s just it: those were our responsibilities. In the “right” example, we itemized our duties with more detail, and then we included achievement(s) for the win. Never been a mall Santa before? Relax. We just need to find some way to show the mall boss that hiring you this Christmas will be their favorite gift. Exceptional locational awareness allowed me to assist guests with directions. Vast knowledge of Fashion Square Outlet Mall to answer questions. See what we did here? At first, working in the mall’s help desk didn’t seem anything like the mall’s Santa. Probably closer to Grinch. But, we played up those duties and achievements which translate well into a mall Santa resume: we explained how knowledgeable we are about the mall, how great we are at answering questions, and how we were already skilled in pushing our tasks off onto Mrs. Santa. Pro Tip: Make sure that there isn’t too much empty space on your resume. We don’t need the hiring manager getting snow blindness when reading it. Is Your Education Section Under-delivering? It Might Be. Why is Christmas just like your last job? Because you do all the work, but the fat guy with the suit gets the credit! But in this case, you want to be the fat guy with the suit. Think you don’t need an education section on your mall Santa resume? Well, the joke would again be on you. The education section is a valuable part of the perfect mall Santa resume. Whether you are still in Santa School and haven’t completed it yet or you finished a graduate degree, the hiring manager will thank you for providing your academic summary. So, how should we put your education on your mall Santa resume? Mall Santa Resume Education Section Example. If you have completed a degree, skip listing your high school. Pro Tip: Only include your GPA if it is as close to 4.0 as possible, and definitely not lower than a 3.7. Listing anything too low will hurt, like flying your reindeer too low over a city. That’s a famous Christmas tune, but also what the hiring manager should say after reading your mall Santa resume. How can we get that reaction? We need to wrap up your skills like a present, tie a red bow around it, and deliver it. A skills section on your resume for a mall Santa is like decking the halls with boughs of holly - fa la la la la la la la la. However, don’t add too much or too little. How do we add just the right amount? First, let’s make a list of some generic hard and soft skills to put on a mall Santa resume. Hard skills are specific abilities and know-how (e.g., Yule Throne 5000). Soft skills are self-developed, life-learned attributes (e.g., safety consciousness, adaptability). But! These are great skills to have for the average mall Santa resume. You’re not average, right? Neither should your resume for mall Santa be. To make your resume unique, we can’t just list these generic terms. A ham seems like a perfect choice for Christmas dinner, but what if they don’t eat meat? It’s time to browse the mall Santa job listing where we’ll underline keywords that match the hiring manager’s appetite. In the second one, your laziness is obvious - you googled mall Santa skills and stuck them in. Like getting every kid in the world the same present, you’ll be unpopular quickly. In the first one, you look like just who the hiring manager is looking for. Pro Tip: Is it snowing? Or is it a whiteout? Blizzard? Flurries? Use action verbs and colorful words to make your resume more appealing to them. No, it’s just another silent night. That’s because our mall Santa resume was drowned out like those quiet Christmas carols. We need to wake them up with some Jingle Bell Rock. We need to sprinkle in a dash of our secret ingredient: extra resume sections. Why is that? Extra resume sections make your mall Santa resume more unique. Everybody puts their name, experience, and so on. This is where you’ll list some relevant things that you’re proud of. Volunteered at hospital for injured veterans. Voted “Sexiest Full-Length Beard” three years in a row. See what’s wrong here? You have every right to be proud of these accomplishments - hell, I know I would be. However, they’re just not mall Santa friendly. But which ones are right? I’ll go over some of the most popular additional sections for your mall Santa resume now, along with some better, more relevant examples. Volunteered delivering Christmas presents to children in need. Avid sitter - average 15+ hours/day. Your knowledge of sitting shows that you function well on your rear, an important trait for the general mall Santa Claus. 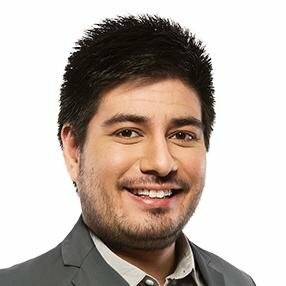 The trivia night shows that you enjoy answering random questions. Voted “Most Believable” at Ho Ho Ho! World Championships 2016. Placed 2nd in last week’s bar trivia night. Know another language? Feliz Navidad come more naturally to you than Merry Christmas? That could be very helpful on a mall Santa resume, and maybe a necessity. Knowing another language could increase the Santa photography business. 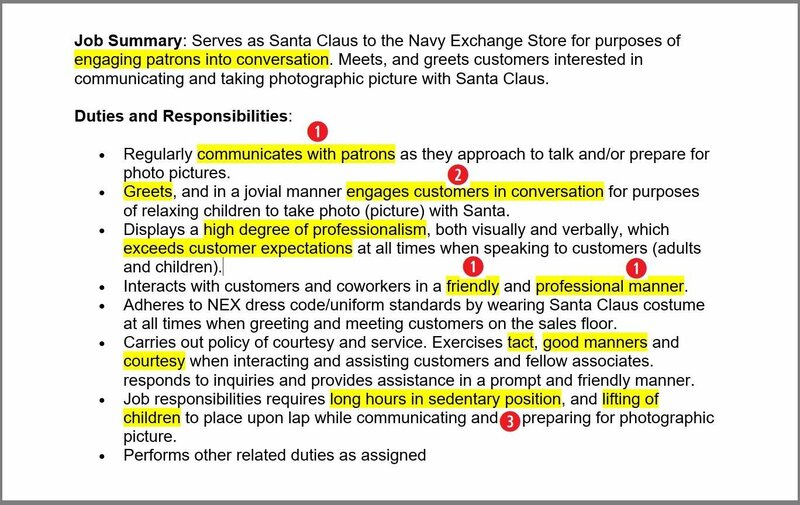 Relevant extra sections on your mall Santa resume will bring holiday mirth and merriment to the hiring manager’s heart. Pro Tip: Snow’s nice, but not too much. The key word above was “sprinkle,” we don’t want a blizzard. Don’t add too many extra sections. 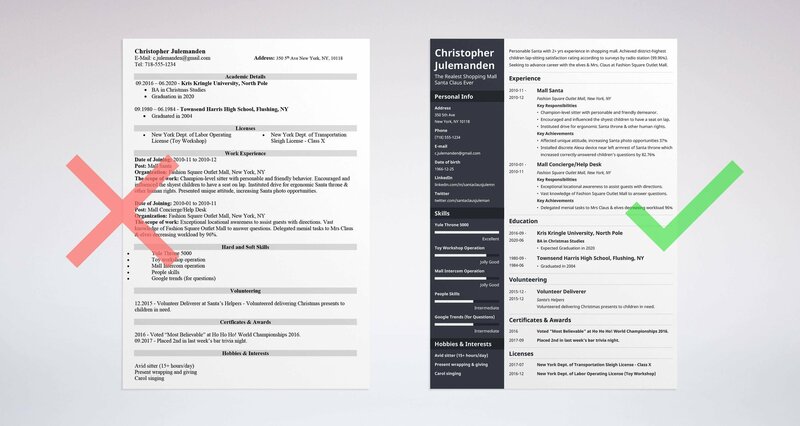 Add only enough extra sections to fill the rest of the current resume page - not more that it spills over onto a new one. You’ve made your list. You’ve checked it twice. Now you’re off to find out who’s naughty or nice. You might have the perfect mall Santa resume, with all the quintessential garlands and ornaments, but something’s missing. You need to include a heartfelt mall Santa cover letter along with your resume! You’ve taken your time on your mall Santa resume writing a compelling objective, adding the perfect keywords, and choosing the ideal skills. Now we have to craft a creative cover letter before serving it all to the mall’s hiring manager, like a child must write that Dear Santa letter. Explain why the Santa job excites you. Drop names - name the hiring manager and shopping mall to personalize it. Inform them why they need you to be the Santa this year. Of course not. Neither do hiring managers. Call them by name in the cover letter. Mention something about the mall that you relate with. You dropped their name and caught their attention - now seal the deal with this next personalization. Be witty. Be charming. Be clever. Positively grab their attention - it will mean more than degrees and certifications you list in your mall Santa worker resume. Pro Tip: Research the mall online and mention something in particular that stands out to you. This is something a resume can’t include and will really catch their eye! How does a hiring manager select the perfect mall Santa resume? By choosing one that follows these simple resume guidelines. Using this procedure for a mall Santa resume and cover letter, you will have earned the right to ascending that Santa throne. Personalize, Personalize, Personalize. The hiring manager will be taking in dozens of applications. Address them by name in the cover letter. Mention the mall in the resume heading. Make yours stand out. You want to join them, so make them need you. You are eager to take this mall Santa job, so be all in. Spice it up with action verbs and impressive achievements to wow them. Paint the best picture of yourself. Double- and triple-check. Spend an extra few minutes making sure that your mall Santa resume and cover letter are up to par. Did they ask to include a particular phrase in the email subject line? Are your email and cover letter addressed to the right person? Now. You should have a resume for a mall Santa that’s cooked to perfection and served just right. Time to attach the final mall Santa cover letter and resume to an email and send it off. So make it good for goodness sake. A step by step guide to writing a professional resume for a construction worker. 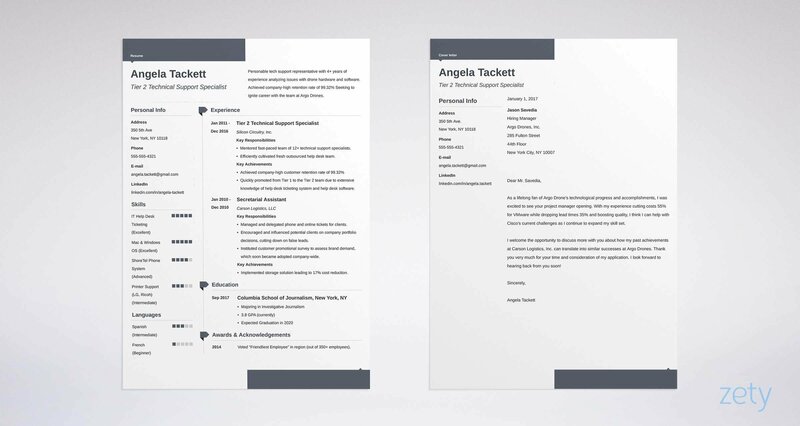 Use our construction resume sample and a template.